A 26 year-old man with severe ARDS due to influenza is currently receiving VV ECMO for respiratory failure. You are asked to review him because an arterial blood gas (ABG) from his right radial arterial line shows that he has an Sa02 of 80%, which is consistent with the SpO2 monitor on his left index finger. Q1. What 3 things should you check initially? The first checks to make in a patient on VV ECMO are to ensure adequate oxygen delivery to the oxygenator and appropriate circuit blood flow. On initiating VV ECMO the FGF and the ECMO blood flow are usually commenced at a 1:1 ratio and then adequacy is checked by performing an ABG. Before anything else, ensure that the fresh gas tubing is connected to the inlet from the fresh gas flowmeter. FGF is titrated to the target PaCO2. 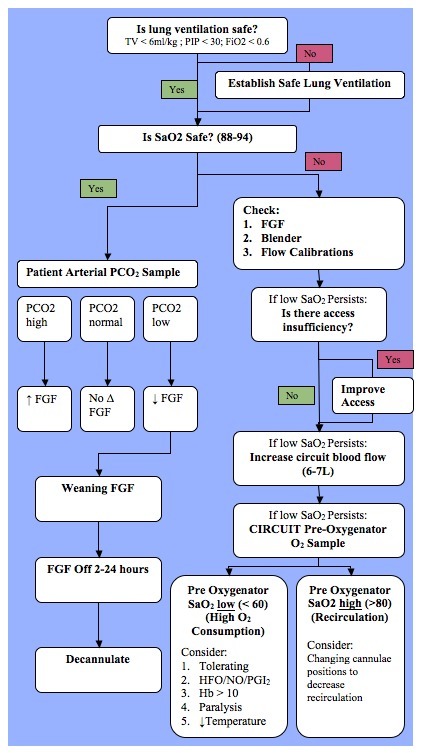 However, if the patient is hypoxaemic it is important to check that the FGF has not been excessively decreased (read from the center of the ‘ball’ on the flowmeter). Don’t confuse the high and low flow sides of the fresh gas flowmeter (make sure only one is selected). At The Alfred ICU the FGF blender setting is routinely set at 100% O2 and is not usually changed, even during weaning. This guards against unintentional inadequate oxygen delivery to the oxygenator. Thirdly, flow calibrations should also be checked. This can be done by turning the pump speed (rpm) to zero while the circuit is clamped, then holding down the ‘0’ button on the PLS or pressing the zero indicator button on the HLS. Remember to then increase pump speed to 1000 rpm before slowly releasing the clamp over 3-5 seconds and then continuing to slowly increase the rpm until target flow is achieved. Target blood flows are chosen such that adequate arterial oxygenation is achieved while allowing non-injurious lung ventilation. Your checks found nothing untoward. The low SaO2 persists. Q2. What should you check next? The next step is to check for access insufficiency. Access insufficiency, if present, must be corrected before you do anything else (a topic for another post!). Despite the further checks, no cause is found. The patient remains hypoxaemic. Q3. What will you do next, and why? Having excluded access insufficiency, you can now increase the circuit blood flow (typically to 6-7 L/min in adults). Normally functioning oxygenators are efficient at oxygenating blood so this should correct any V/Q mismatch caused by insufficient circuit flows. You do that… The patient is still hypoxaemic! Q4. Now what will you do, and why? Perform a pre-oxygenator blood gas to check the SO2. Having excluded many of the possible causes of hypoxaemia in a VV ECMO patient, we still need to consider the possibility of high oxygen consumption or recirculation. Q5. What are your options if the measurement performed in Q4 is LOW? Q6. What are your options if the measurement performed in Q4 is HIGH? This suggests that recirculation is occurring. If so the access cannula SO2 will be high, despite the low SO2 from the patient’s arterial line. It means that flow from the return cannula is entering the access cannula, rather than being distributed to the patient. Regardless of the configuration of VV ECMO (femoral-femoral, femoral-jugular or high flow) the tip of the access cannula should be 8 to 15cm apart to minimise recirculation. An alternative explanation is that the cannula are correctly positioned but flowing in reverse… Make sure this isn’t the case!